What’s ASCO? Why should I care? The American Society of Clinical Oncology (ASCO) is an organisation representing physicians who specialise in the care and treatment of cancer patients. Approximately 30,000 visitors from around the world gather each year for the ASCO Annual Meeting to discuss recent advancements in the treatment of cancer. Visitors include physicians, scientists, nurses and others. 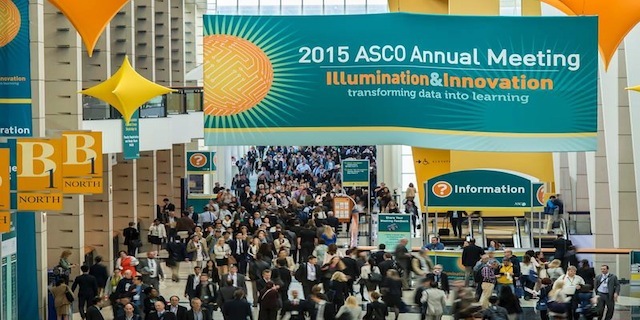 ASCO is where major scientific discoveries in cancer are presented, often, for the first time. The ASCO 51st Annual Meeting took place in Chicago on 29 May-2 June 2015 and the highlights are discussed below. How should this information be interpreted? At conferences like ASCO scientific, discoveries are usually presented before publication and without complete peer review process. So the early and final results of research are not presented in complete form that can be reviewed by medical and scientific peers and by journal editorial processes. Therefore, everything should be taken with a grain of salt. Soon enough, papers will be published in upcoming journals for most of these early announcements and presentations. In any case, we must emphasize to the reader: You must not take action without consulting your doctor / physician. This is part 1 of a 2 part post. Second post will come next week, stay tuned. Can anamorelin reduce wasting and weakness in patients with advanced non-small cell lung cancer? Cachexia is general wasting and weakness which generally occurs in end-stage cancer patients. It is the loss of body mass and cannot be reversed by increasing nutritional intake. A clinical trial has recently published findings which suggest that a drug called anamorelin can effectively reduce cachexia in patients with non-small cell lung cancer. Patients receiving anamorelin for 12 weeks had an increase in lean body mass and body weight. Patients receiving the placebo continued to lose weight. Approximately one third of all cancer patients die from cachexia rather than cancer and anamorelin is the most effective drug developed so far which can treat cachexia. Should Nivolumab be the first-line drug choice for advanced non-small cell lung cancer? Nivolumab (OPDIVO) is the second-line drug choice for the treatment of squamous NSCLC. This means that the drug is taken when the primary treatment option has failed. A recent trial has shown that nivolumab may also be effective in increasing survival in patients with advanced non-squamous NSCLC in which certain chemotherapies have stopped working. 292 patients received 3 mg/kg nivolumab every two weeks, while 290 patients received 75 mg/m2 of docetaxel (Taxotere) every 3 weeks. Patients receiving nivolumab had a higher survival (12.2 months) in comparison to those receiving docetaxel (9.4 months). This trial demonstrated that nivolumab can reduce the risk of death by 27% in comparison to docetaxel. Immunotherapies such as sipuleucel-T (Provenge) are used to treat prostate cancer by marking the tumour for destruction by the immune system. Sipuleucel-T has been shown to be effective in increasing survival by 4.1 months in prostate cancer patients. However, immunotherapies for castration-resistant prostate cancer (tumour continues to grow after use of the testes has been inhibited, either by surgery or hormone treatment) can still result in the cancer returning. Therefore, future therapies will investigate the effectiveness of combining immunotherapies with other drugs such as ipilmumab (Yervoy). The overall survival may be enhanced by using a combination of other agents. Docetaxel (Taxotere) is a chemotherapy drug which is used to treat various cancers, including prostate cancer. A clinical trial involving 2962 men with metastatic prostate cancer (cancer has spread to distant organs) or locally advanced non-metastatic prostate cancer (cancer has started to reach into nearby tissues and lymph nodes) showed that docetaxel is effective in prolonging failure-free survival (survival without failure of treatment). Patients received hormone therapy alone or in combination with docetaxel. The average overall survival in men receiving docetaxel was 10 months more than those receiving hormone therapy alone. Docetaxel should therefore be considered in combination with hormone therapy for men with advanced prostate cancer. Treating breast cancer patients who are hormone receptor positive (HR+; the estrogen and progesterone receptors are present on cancer cells) with hormone therapy such as fulvestrant (Faslodex) can result in resistance to treatment. This occurs when tumours grow despite treatment. Palbolciclib (IBRANCE) is a drug which has been shown to be effective in prolonging survival in breast cancer patients resistant to hormone therapy. In a clinical trial, 521 patients with advanced hormone resistant breast cancer received 125 mg palbociclib and 500 mg fulvestrant. The combination of palbociclib with fulvestrant increased progression-free survival (time after treatment when cancer does not get worse) by 5.4 months compared to fulvestrant alone. However, a lower dose of palbociclib was required in some patients due to side effects such as a low white blood cell count and fatigue. HER2 is a protein that is responsible for growth of breast cancer cells in some women. Trastuzumab (Herceptin) is a drug specifically targets this protein, encouraging its destruction by the body’s own immune system. Trastuzumab emtansine (Kadcyla), also known as TDM-1, is a similar drug, except it contains an agent which kills these breast cancer cells rather than promoting immune destruction. A recent trial involved 1095 patients with advanced HER-2 positive breast cancer. Patients received TDM-1 with pertuzumab (Perjeta), TDM-1 alone or THP (a combination of docetaxel, trastuzumab and pertuzumab). After 35 months, patients receiving TDM-1 with pertuzumab had a greater survival (15.2 months). Patients receiving TDM-1 alone had a survival of 14.1 months. Patients receiving THP had a survival of 13.7 months. Although TDM-1 had fewer side effects, the trial concluded that THP will still remain as the first-line drug choice for HER2-positive breast cancer. The ASCO 51st Annual Meeting has highlighted some of the various avenues of research currently being investigated for treating patients with cancer. The new information presented suggests a number of key findings: In hormone-resistant breast cancer patients, a combination of palbocilib with fulvestrant can increase survival. In patients with advanced non-small cell lung cancer, nivolumab can also increase survival. In advanced prostate cancer patients, hormone therapy may be combined with docetaxel to increase survival. Interestingly, anamorelin may reduce wasting in lung cancer patients, while exercise may also help prevent cancer returning in treated patients. Soon we’ll publish part 2 of our findings. Stay tuned.